Wondering where the best place to stay in Gainesville, Florida is? Welcome to the Sweetwater Branch Inn! This historic bed and breakfast offers its guests beautifully decorated rooms, is pet friendly, is near the University of Florida, and has an outdoor space that is perfect for a Gainesville wedding or any other special occasion. Sure, you could stay at any ol’ hotel in Gainesville, but why do that when you can stay at the Sweetwater Branch Inn? You’ll feel right at home with its unique charm and character and feel like you are part of the family thanks to their friendly staff. The Sweetwater Branch Inn has a few buildings, most of which can be accessed by the main entrance off of East University Avenue. Guests have the option to stay in a suite in one of the main buildings or can stay in one of the larger cottages that include a kitchen and living room. Take a stroll on winding brick pathways, read a book under the gazebo, or admire the fish in the pond. The inn is known for its gardens and has hosted weddings, family reunions, baby showers, and business events. We personally loved the fountains and statues that are placed throughout the grounds. The Sweetwater Branch Inn also has a heated 30-foot eco-friendly salt pool and spa along with plenty of lounge chairs and umbrellas. Guests will conveniently find pool towels in their room, so remember to pack your bathing suit! We absolutely loved the decor at the inn! The Sweetwater Branch Inn is actually listed on the National Registry of Historic Places and has gone through extensive renovations to showcase its Victorian roots. We think it’s one of the most romantic places in Gainesville and could picture ourselves sipping tea in a beautiful gown as if it were the late 1800s. Inside the Cushman-Colson House: A small dining area, living room, and staircase leading to the second floor bedrooms. During our stay, we stayed in the Piccadilly Suite in the Cushman-Colson House. Each of the seven rooms in the house is decorated differently with a different theme. Ours had a Key West theme and we loved the flowers and plants throughout the room. We slept on a queen-size bed with soft pillows and enjoyed having our own private Victorian sunroom where we could do some work. Our room also had its own bathroom with walk-in shower. If you’re looking for organic and farm-to-table options in Gainesville, the Sweetwater Branch Inn has you covered. Their breakfasts are made from scratch every morning and they offer a variety of dishes. There is a cold breakfast bar, with fresh local fruit, organic yogurt brought in from a nearby farm, and homemade granola made from organic oats. We made ourselves a small yogurt parfait every morning! They also have piping hot options including casseroles, quiches, pancakes, biscuits, and pastries. Every morning we had something different, and every morning it was delicious. You can tell a lot of thought and love goes into every meal. And if you have any dietary needs or restrictions, they will gladly accommodate. The Sweetwater Branch Inn is also the home of The Sweet Tea, a restaurant that serves up southern cuisine. Their menu includes items like chicken pot pie, fried shrimp, and southern catfish po’boy. Unfortunately, during our visit to Gainesville we didn’t have time to stop in, but we heard great things about the restaurant from locals. Even our coffee was organic! The Sweetwater Branch Inn is close to many of the popular attractions in Gainesville, but still in a quiet neighborhood. If you’re in town to visit a student or to see some Gator football, the inn is near the University of Florida (Ben Hill Griffin Stadium is only a 7 minute drive away). Downtown Gainesville is even closer! Popular restaurants like Big Lou’s NY Style Pizzeria are within a 10 minute walk. Needless to say, we were sad when it was time to leave. We had gotten to know the staff, including Cornelia, the owner of the inn. We truly felt like we’d become part of the family, discussing local events and some of the things to do in Gainesville. Every morning after breakfast they’d wish us a good day and every evening when we came back they asked us how our day went. Those personal interactions are one of the things we will miss the most about our stay at the Sweetwater Branch Inn. 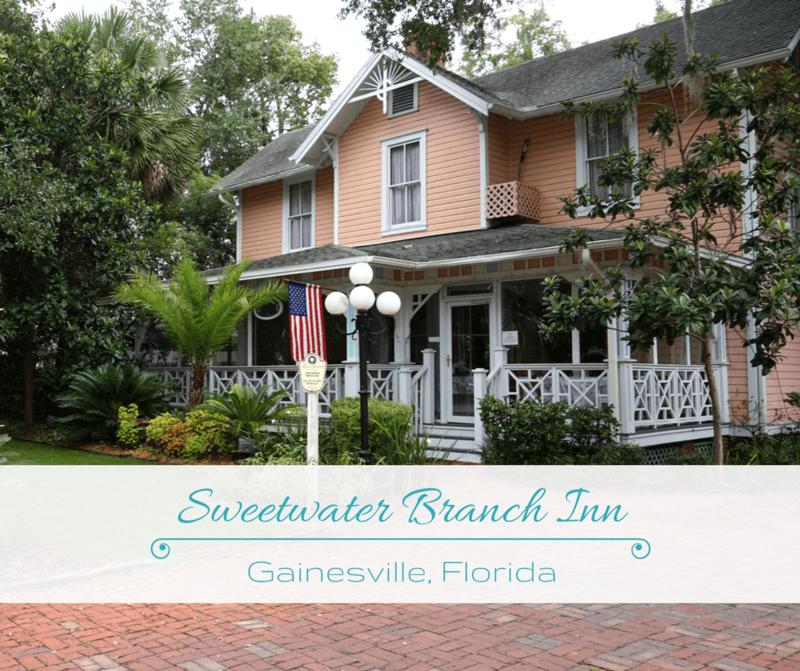 So if you are still wondering where to stay in Gainesville, we definitely recommend the Sweetwater Branch Inn. This cozy bed and breakfast will have you feeling rested, relaxed, and ready for whatever plans you may have.